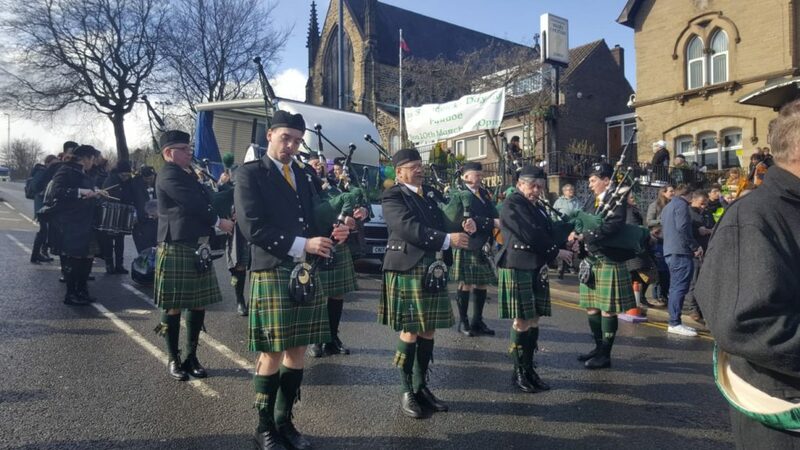 Sunday 10th March – Huddersfield Saint Patrick’s Parade. Saturday 16th March – Derby Saint Patrick’s Day Parade. 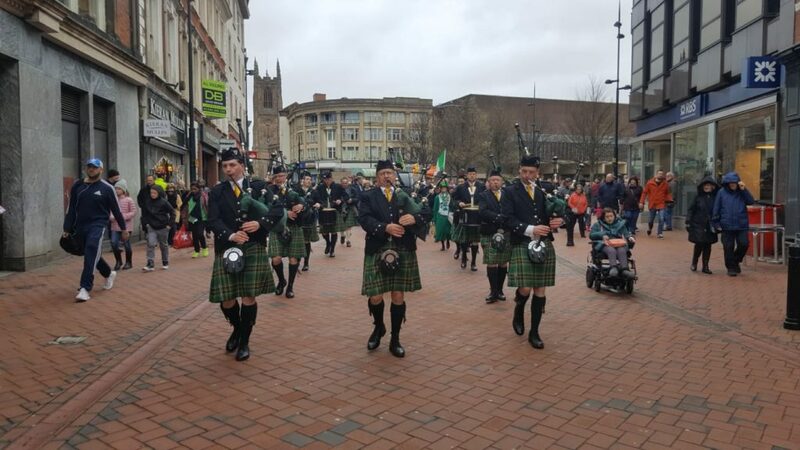 Sunday 17th March – Birmingham Saint Patrick’s Day Parade. As usual we have had a really busy March playing in 3 great Saint Patrick’s Day Parades. The weather at all of them was very changeable and at each and every one of them we went through 4 seasons in an hour. Well done to all in the band that turned out and as usual we produced a great sound, looking smart and very well presented. A huge thanks to the Parade Committee’s that booked us for their events and well done on great occasions on all your days. A huge amount of work leads up to the actual event and in the end the weather can play such an important role in the turnout and enthusiasm. Your parades were a huge credit to all the work that was put in to them. Derby Saint Patrick’s Day Parade. 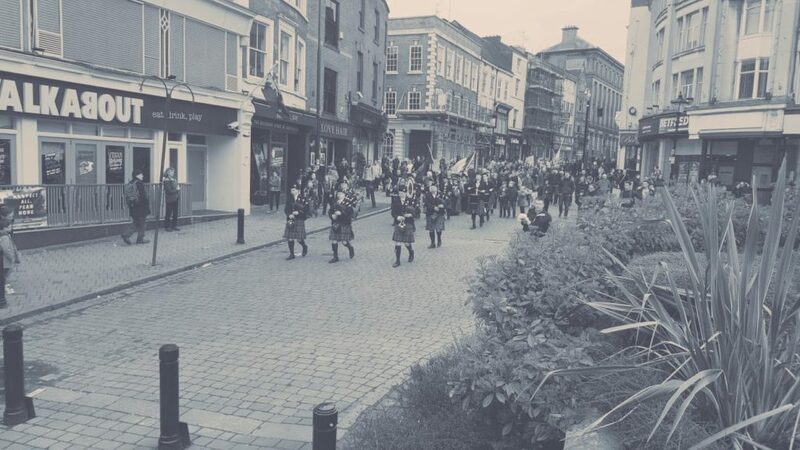 Well done to Joel Grigg who as the new Pipe Major had 3 big events to get the band through and with the help of new Pipe Sergeant Thomas Coughlan both did an amazing job. They are both young and very talented pipers and we look forward to their leadership of the band. Pictures of the Birmingham Saint Patrick’s Day Parade will follow. Maurice Long. 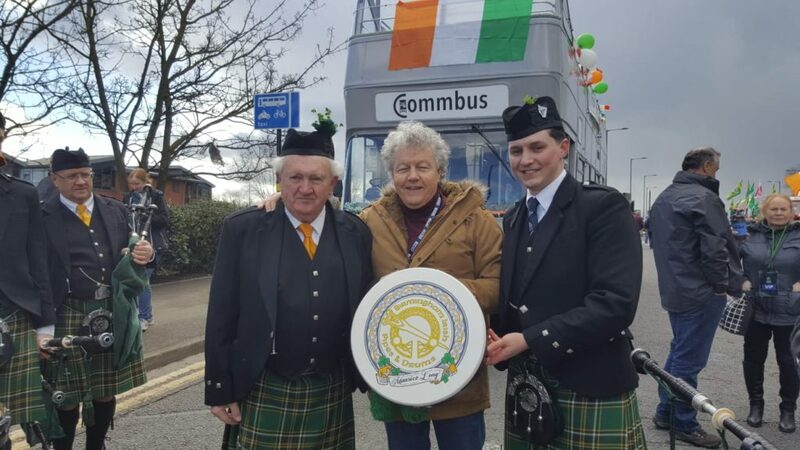 A founder member of the band (20 years ago), was presented with a hand made, hand painted Bodhran from one of Ireland’s best instrument makers. It was presented by the bands new Pipe Major Joel Grigg along with Bob Brolly whose Irish Show on BBC WM was where the band first advertised for members to start the band off. It was a thank you to Maurice for all the dedication and hard work to the band over an incredible 20 years. The amazing Bodhran was ordered from BarrysBodhrans.com A PDF of the band logo was sent to Barry and he did the rest. It looked amazing.